GST fusion protein with sequence YHRETEGEEQAQYLQVTSCPKIPSSPDLKK SRSASTISKSDYMEIQEGVNNSNEDFREENLKTANCTLANTNYVNITKMLTDV, corresponding to amino acid residues 417-499 of rat KV1.2 (Accession P63142). Intracellular, C-terminus. Homology Mouse, dog, human, - identical. Purity The serum was depleted of anti-GST antibodies by affinity chromatography on immobilized GST and from cross-reactive antibodies by affinity chromatography on immobilized KV1.1-GST-fusion protein and KV1.4-GST-fusion protein. The antibody was then affinity purified on immobilized KV1.2-GST. Control antigen reconstitution 100 μl PBS. 1. Anti-KV1.2 (KCNA2) Antibody (#APC-010), (1:200). 2. Anti-KV1.2 (KCNA2) Antibody, preincubated with the control peptide antigen. 2. Anti-KV1.2 (KCNA2) Antibody, preincubated with the control antigen. Mouse cerebellum (1:350) (Kleopa, K.A. et al. (2006) Brain 129, 1570.). HeLa transfected cells (1:200) (Kleopa, K.A. et al. (2006) Brain 129, 1570.). McKinnon, D. (1989) J.Biol. Chem. 264, 8230. Long, S.B. et al. (2005) Science 309, 897. A functional KV1 channel is either a membrane spanning homotetramer or heterotetramer, which is composed of members of the same subfamily. In addition several auxiliary subunits and intracellular proteins might interact with the channel and affect its function. Alomone Labs is pleased to offer a highly specific antibody directed against an epitope of rat KV1.2. Anti-KV1.2 (KCNA2) Antibody (#APC-010) can be used in western blot, immunohistochemistry, and immunocytochemistry applications. It has been designed to recognize KV1.2 from human, rat, and mouse samples. Human lung carcinoma cell line A549 isolated nuclei. Jang, S.H. et al. (2015) J. Biol. Chem. 290, 12547. Lv, Y. et al. (2013) Am. J. Physiol. 305, L856. Mouse spinal cord lysate (1:1000). Zoupi, L. et al. (2013) Glia 61, 1236. Takahashi, R. et al. (2013) J. Urol. 190, 2296. Mouse spinal cord and cortex sections (1:200). Gojkovic-Bukarica, L. et al. (2011) Eur. J. Pharmacol. 654, 266. Kleopa, K.A. et al. (2006) Brain 129, 1570. Sobieski, C. et al. (2015) J. Neurosci. 35, 11105. Hao, J. et al. (2013) Neuron 77, 899. Horn, K.E. et al. (2013) Cell Rep. 3, 173. Bin, J.M. et al. (2012) PLoS ONE 7, e41237. Cazzin, C. et al. (2011) Genes Brain Behav. 10, 817. Irani, S.R. et al. (2010) Brain 133, 2734. Savvaki, M. et al. (2010) J. Neurosci. 30, 13943. Sun, W. et al. (2010) J. Neurophysiol. 103, 469. Utsunomiya, I. et al. (2010) J. Neurochem. 112, 913. Hayashi, Y. et al. (2009) Am J. Physiol. 296, R1661. Hsiao, C.F. et al. (2009) J. Neurophysiol. 101, 1407. Cox, R.H. et al. (2008) Am. J. Hypertens. 21, 213. Gautier, M. et al. (2007) Am. J. Physiol. 292, 475. Neshatian, L. et al. (2007) Am. J. Physiol. 292, G1233. Rivera, J. et al. (2007) Eur. J. Neurosci. 25, 136. Susuki, K. et al. (2007) Glia 55, 746. Kuba, H. et al. (2006) Nature 444, 1069. Fordyce, C.B. et al. (2005) J. Neurosci. 25, 7139. Kuba, H. et al. (2005) J. Neurosci. 25, 1924. Wang, J. et al. (2005) Am. J. Physiol. 288, L1049. Karimi-Abdolrezaee, S. et al. (2004) Eur. J. Neurosci. 19, 577. Nakayama, H. et al. (2004) J. Neurosci. 24, 3199. Dodson, P.D. et al. (2003) J. Physiol. 550, 27. Popratiloff, A. et al. (2003) J. Comp. Neurol. 461, 466. Rios, J.C. et al. (2003) J. Neurosci. 23, 7001. Adamson, C.L. et al (2002) J. Neurosci. 22, 1385. Arroyo, E.J. et al. (2002) J. Neurosci. 22, 1726. Chittajallu, R. et. al. (2002) Proc. Natl. Acad. Sci. U.S.A. 99, 2350. Felix, R. et al. (2002) Zygote 10, 183. Chung, Y.H. et al. (2000) Brain Res. 875, 164. Conforti, L. et al. (2000) J. Physiol. 524, 783. Nashmi, R. et al. (2000) Eur. J. Neurosci. 12, 491. Arroyo, E.J. et al. (1999) J. Neurocytol. 28, 333. Sobko, A. et al. (1998) J. Neurosci. 18, 10398. Yuan, X.J. et al. (1998) Am. J. Physiol. 274, L621. Attali, B. et al. (1997) J. Neurosci. 17, 8234. Wang, J. et al. (1997) J. Clin. Invest. 100, 2347. Anti-KV1.2 (KCNA2) (extracellular) Antibody (#APC-162). This antibody recognizes a different epitope and thus can also be used as a control for detecting KV1.2. KV1.2 (KCNA2) Channel Overexpressed Membrane Fractions (#LX-101). The KV1.2 overexpressed membrane fractions enables end users to check the expression of endogenous KV1.2 as opposed to a tagged version and serves as a positive control for testing the expression of the channel and a quick way to test the antibody. KV1.2 (KCNA2) Channel Antibody and Membrane Fractions Kit (#LK-101). This kit includes the KV1.2 overexpressed membrane fractions, and Anti-KV1.2 (KCNA2) Antibody (#APC-010). A fluorescent labeled specific KV1.2 blocker. 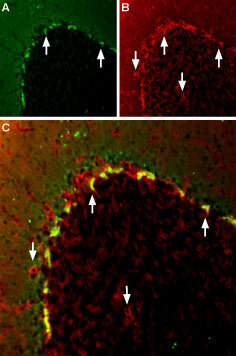 It can be used in immuno-colocalization studies to label KV1.2 channels. This antibody recognizes an extracellular epitope and can be used to detect KV1.2 in live cells. A fluorescent labeled specific KV1.2 blocker. It can be used in living cells to detect KV1.2 channels.